We, MARZA ANIMATION PLANET delivers the best entertainment through the world as the animation studio making CG animation filled with authentic characters and original stories to make an impression and offer delight to our customer with cutting-edge technologies and top class quality. VE Research & Development Department is established as CG image production department in SEGA CORPORATION. 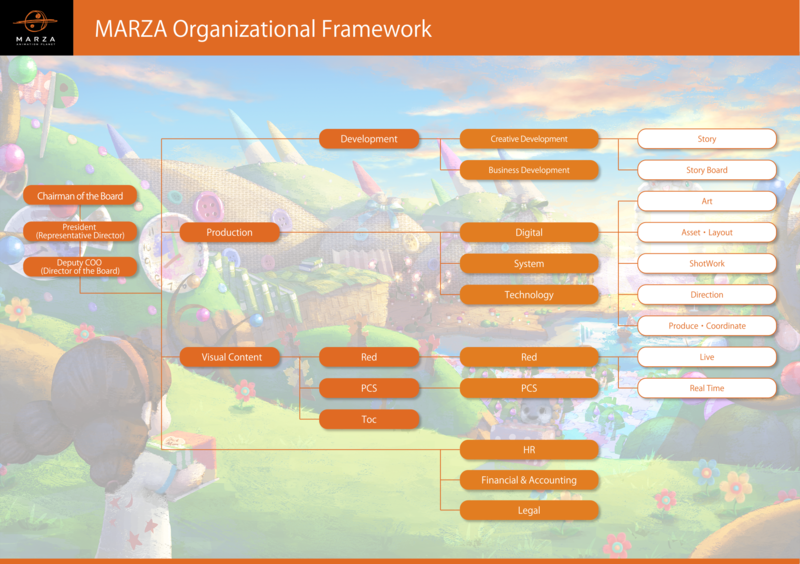 CG image production department in SEGA CORPORATION (VE Research & Development Department) becomes a separate company, and founds Sega Sammy Visual Entertainment Inc.
Company name changes to MARZA ANIMATION PLANET INC.
MARZA ANIMATION PLANET INC. merges with Sega Sammy Investment & Partners Inc. The subsidiary company, MARZA ANIMATION PLANET USA INC. is established at San Francisco, California. The subsidiary company, MARZA ANIMATION PLANET USA INC. is relocated its head office to Los Angeles County, California. MARZA ANIMATION PLANET INC. becomes a subsidiary of SEGA Holdings Co., Ltd.
MARZA ANIMATION PLANET INC. becomes a subsidiary of TMS ENTERTAINMENT CO., LTD., which is the subsidiary company of SEGA Holdings Co., Ltd.
Management of SEGA SAMMY group as the holding company.